A image of what the Pharr Bridge Business Park will look like when completed is displayed as city leaders break ground on the site on Tuesday, March 13, 2018, in Pharr. PHARR — Construction of the 300,000-square-foot, $26.3 million Pharr Bridge Business Park got underway here Tuesday. 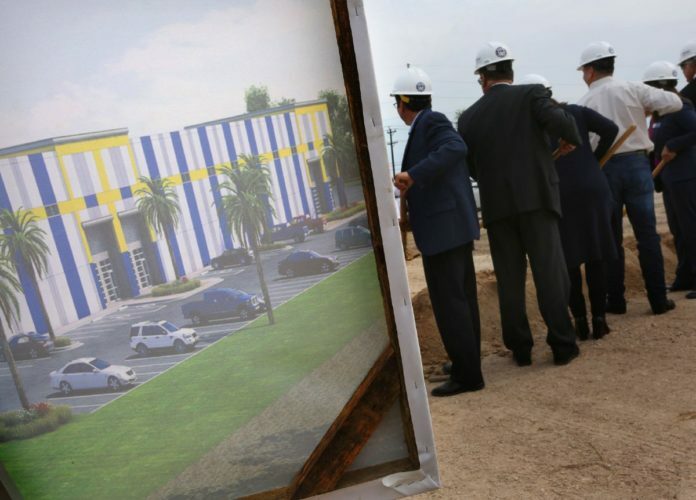 The facilities will be used for dry goods distribution and transportation, according to Carlos Canales, who will own the business park and invested $25 million into it — the city paid $1.3 million, Economic Development Corporation President Victor Perez said. Medical materials, electronics and automotive materials, Canales said, will be among the goods passing most frequently through the park located just one-and-a-half miles north of the Pharr-Reynosa International Bridge. The first segment of the facilities is expected to be complete by the end of the year, Canales said. This vast stretch of cold and dry storage facilities on High Line Road, and surrounding streets just north of the bridge, is part of an ongoing effort to grow the area’s cross-border trade business, said Mayor Ambrosio Hernandez, who has been trying to get this project started with Canales for a while. The most recent significant facility to open near the bridge was a 60,000-square-foot avocado ripening and distribution center in January down the street from the business park. With the bridge being the largest product port of entry in the country, cold storage facilities are often useful near the bridge. While southbound traffic flowing over the region’s bridges has declined in recent months, northbound truck traffic has swelled at the Pharr Bridge. From October 2017 to January 2018, truck traffic increased more than 3,800 comparing each of those months to the ones a year prior. In January, 55,097 trucks crossed the bridge northbound. Even though truck traffic has increased, the process to lure Canales and get the business park built has taken a while. And the city is pleased that process is over.